Nina's Paris is a French tea company with a long history. It started in 1672 as a distillery of essential oils and became the supplier of fragrances for the Court of Versailles. The fragrances can be found in their teas today. They graciously offered to send a few samples, and I decided to try their signature blend first. 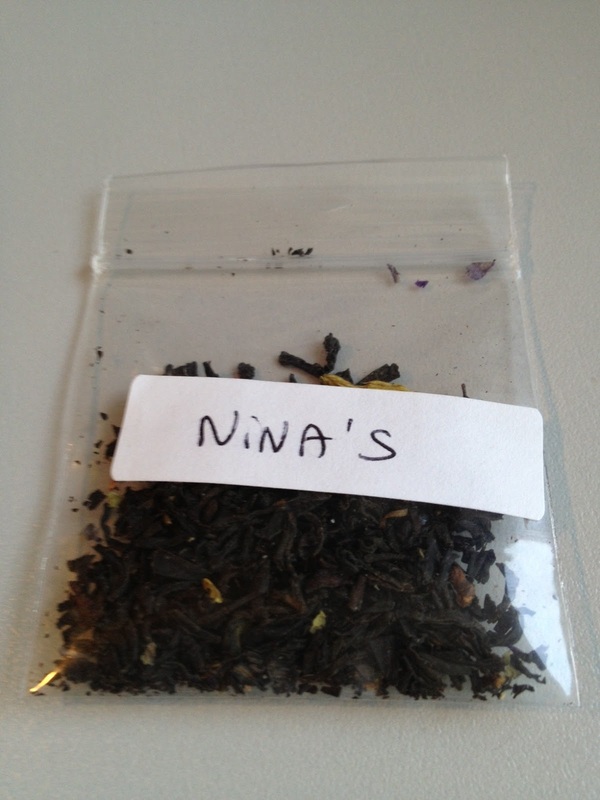 The sample bag just says Nina's on it, so I'm assuming this is their signature blend Nina's Paris. The leaves look similar to the picture posted on Steepster. There are a few tiny purple leaves in the mix (hard to see in my picture), I wonder what they are? Lavender? I didn't taste anything floral. The dry leaves as well as the brewed tea has a dominant orange aroma. This translates through to the taste. I'm getting a little peach and strawberry as well, but not really any cherry as described on their website. As it cools down, I can detect a cherry note, and the strawberry becomes more powerful. I'm not usually drawn to flavored blends but this is a nice springtime sip since it is juicy and light. It evokes a lush green garden tea party on a warm sunny day. I can even hear the bounce of the badminton rackets. It would make a lovely iced tea, something I'll keep in mind when the weather finally warms up. I have two other blends from Nina's to try, a coconut scented Magicienne which smells like a summertime cocktail, and Gemini, a fruity rooibos. I admit they both smell amazing, and I look forward to tasting them soon. I am also intrigued by their Marie Antoinette blend, which uses apples from the King's Kitchen Garden in Versailles. It would add a fun royal touch to any afternoon tea table. The teas can currently be purchased through their Amazon store here, and they are currently working on their US website.